Frank Chan Fan, Secretary for Transport and Housing, says the vacancy rate tax does not aim to contain developers nor restrict property prices, which were affected by multiple factors, but is targeting the sale of primary property. Nine percent of the annual housing supply, or 9,000 units, was vacant in March last year. 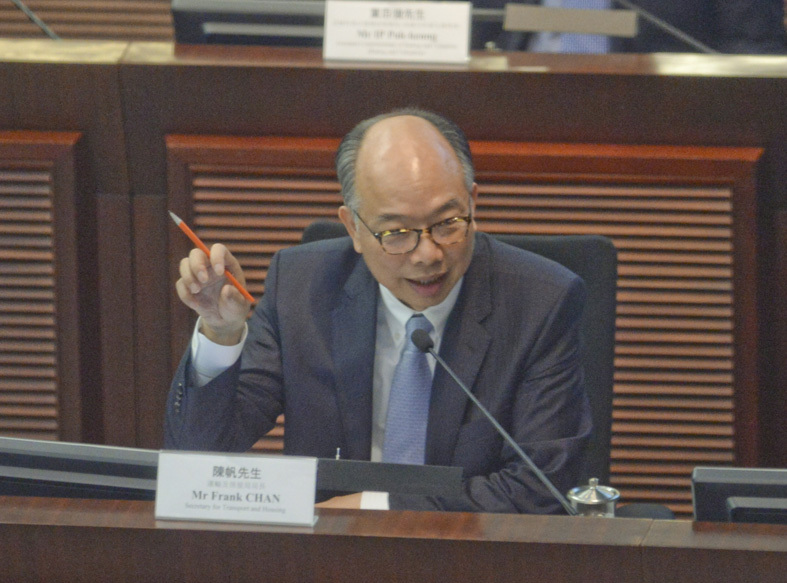 Tommy Cheung Yu-yan, Liberal Party chair, said the disadvantage of the proposed policy are more than the advantages, and question Frank Chan why service apartments are not included. He asked the government to clarify the figure of 9,000 vacant units in Hong Kong. Peter Shiu Ka-fai, vice chair of the Liberal Party, said the vacancy rate in Manhattan, United States, is 4 percent and in Singapore 8 percent, and neither places have a vacancy tax. He said the proposed policy is unmerited. The Deputy Secretary for Transport and Housing (Housing), Esther Leung Yuet-yin, said the vacant units were counted in buildings completed in the past seven years and serviced apartments may be counted in the 9,000 units. Abraham Shek Lai-him, a member of Business and Professionals Alliance for Hong Kong, said the policy should cover all property owners and not just target developers. The Basic Law says the government should protect and respect private property rights, and he urged the government to follow it. Jeremy Tam Man-ho, a member of Civic Party, was afraid developers would offer a subsidy to staff members for renting the vacant flat while the staff members might not live in the flat. Frank Chan said that making a false statement is a crime and the flat should be lived in by someone. Roy Kwong Chun-yu, a member of Democratic Party, said developers may rent a flat to an affiliated company to avoid the tax. Chan replied that the proposed policy already bars a developer from renting a flat to subsidiaries. Meanwhile, The Consonance in North Point, owned by billionaire Lee Shau-kee, has recorded 2.75 times over-subscriptions. The developer may launch more units before the project is put on sale while the price of new flats may slightly increase. Henderson Land Development (0012) launched 28 units of The Addition in Cheung Sha Wan with average price of HK$20,707 per square feet after discount. That is lower than the first batch's average price of HK$20,850. The lowest price unit of the 28 is on the fifth floor, flat C, with 227 sq ft. The price is HK$54.5 million, or HK$19,682 per square foot.